At the tab Trigger Options of the Advanced Options Dialog you can setup and use the unique feature of Triggers on import source. The essence of Triggers is that they allow you to introduce changes in a source row after it has been successfully imported to your destination MySQL table. In the box under the grid you can see the resulting statement. With the button Parse you can check if it is correct. Please remember that the values must be syntactically correct, that is use quotes for strings, etc. To delete imported rows from the source. 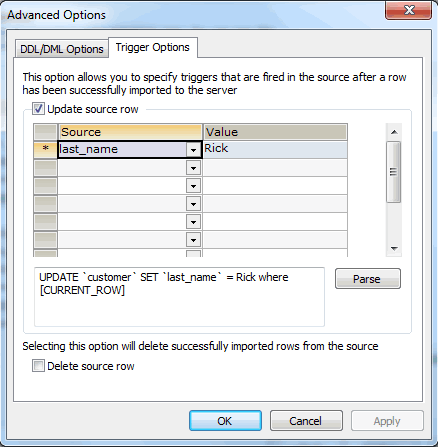 For this, check the option Delete source row. * you can increment a numerical field (call it "number_of_imports") by adding 1 to that field. * you can write current date and time to a datetime variable type using some datetime() function. This is particularly useful for incremental imports. The most obvious application of this feature is that you can mark the rows that have already been imported by assigning a certain value to some column directly in the source. Additionally, combined with use of a SQL Where statement, triggers allow arranging incremental import sessions.